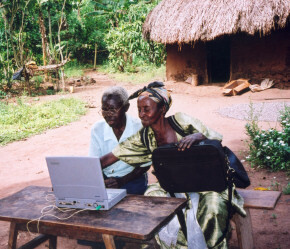 There is awareness that people in the rural areas must be included in the digital revolution. How to share Information and Communication Technology (ICT) developments with the rest of the country and ultimately with the rest of the world to bridge the digital divide is the challenge. Countries in Africa, with the support of the UN Economic Commission for Africa, are using ICTs to provide education and health services, create competitive businesses, and to build an inclusive and sustainable information society. Half of Uganda's 23 million inhabitants are under the age of 14, and most people live in the rural areas. So education in towns and villages is a high priority for the government. The government's goal is to transform Uganda into a service-oriented economy. But for IT to be the cornerstone of a vibrant business sector, the government realizes that it has to address Internet access costs. Technology is being used to improve health care, particularly in the rural areas. Up until now, doctors in outlying areas have had to rely on their own skills and knowledge to treat patients. In 1994, around 800,000 Tutsi's and moderate Hutu's were murdered in Rwanda. The country's jails are still crammed with around 100,000 suspects who are still awaiting trial. It would take more than a century to try all the cases. So Rwanda has chosen to use its traditional justice system called Gacaca. The government passed a law in 2001 formalizing this traditional system of justice. ICTs are being used to record the testimonies. Servers have been installed in the Ministry of Justice in the capital, Kigali, to store the information. Every Saturday in villages around Rwanda, Gacaca courts convene to give citizens, prisoners and victims' families the opportunity to face each other before a panel of locally-elected judges. The judges then issue verdicts. All the evidence and verdicts are collected and sent to the Ministry of Justice. The genocide wiped out skilled and professional people, depriving the public services of its human resources. ICTs are being used to facilitate the provision of services. Education on its use is a priority. Also, President Paul Kagame's vision is to move Rwanda from an agricultural society to a knowledge-based economy. The President is one of the continent's major proponents of ICTs. His government with the assistance of the United Nations Economic Commission for Africa is creating the infrastructure and providing technical support and training. President Kagame's aim is turn Rwanda into an ICT hub in the region. He is investing heavily in educating his fellow countrymen and women. Ethiopia is home to some of the world's most exotic and ancient civilizations. The country has a rich diversity of cultures and religion. Some of our oldest known human ancestors have been found there. Ethiopia is in transition. A lot of changes are going to achieve its national development goals and is investing heavily in the ICT sector. Telecom is the basis for the ICT sector, but there is still a monopoly in the Telecommunications market. There are over 80 different languages spoken in the country. Ethiopia has its own alphabet. The Department of Computer Science at the University of Addis Ababa, is working to make computers part of daily life. Ghana's rich heritage has produced many historical landmarks. The oldest of these is the Castle of Elmina. It was built by the Portuguese explorers who were lured to the coast of this West African country by its vast quantity of Gold. Later Elmina was taken over by the Dutch at the height of the slave trade. Ghana was the first colonized African country to gain independence and today its people consists of urban and rural workers, traders and fishermen. About 19 million people live here. Most of them, 44 per cent are under the age of 14 and the Ghana vision is to transform the country from its low economic status to bustling middle income status by the year 2020. The country has come a long way in developing ICTs. It has liberalized and open up its markets creating a favorable climate to attract investors. The port of Tema, close to the capital Accra, is more than a mere loading or unloading place for goods. It�s a traffic junction where goods are imported and transshipped to the neighboring land locked countries. Taxing these good provides revenue for the Government. Before rims of paper were needed for the administration but this is fading out as computers are introduced to do this. A major concern of the Ports Authorities is to ensure that it is not used for trafficking arms. Two container scanners have been installed so controlling the contents of a container is now much easier. ICT has improved efficiency at the port, so benefiting the government and the citizens.